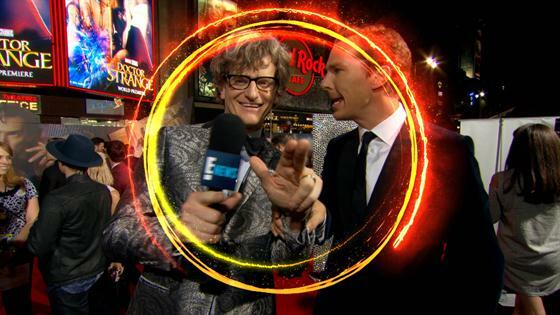 "Doctor Strange" Stars Show Off Magic Powers! There's never been a trippier Marvel movie than Doctor Strange. Benedict Cumberbatch plays the titular character, whose life changes forever after a car accident limits the use of his hands. When traditional medicine fails him, he seeks help in a mysterious place: an enclave known as Kamar-Taj. He soon learns that the healing center is more than it appears, as it's mean to battle "unseen dark forces bent on destroying our reality." With newly acquired magical powers, Doctor Strange must choose whether to return to his civilian life or leave it all behind to defend the world as the most powerful sorcerer in existence. Directed by Scott Derrickson and produced by Kevin Feige, Marvel Studios' action-adventure movie is rated PG-13. Scott Adkins, Benjamin Bratt, Chiwetel Ejiofor, Rachel McAdams, Mads Mikkelsen, Michael Stuhlbarg, Tilda Swinton and Benedict Wong round out the cast. • "What Robert Downey Jr. is to Iron Man and Ryan Reynolds is to Deadpool—that's what Benedict Cumberbatch is to Doctor Strange. By that I mean, he's everything," Rolling Stone's Pete Travers writes. "The British actor, flashing an American accent eons away from the plummy tones of Sherlock or Hamlet, is the creative spark that ignites this bracing new entry in the Marvel cinematic universe." But, to Derrickson's credit, the movie deviates "just enough from the cookie-cutter Marvel pattern to become its own living, breathing, thrilling thing." • "All in all, Doctor Strange is a fun and trippy excursion to a place where Marvel rarely seems to go: that is, to the retinal roots of the comics," The Washington Post's Michael O'Sullivan writes. "The story may be nothing to write home about, but the sights to be seen there—which put the 'bullet time' sequence of X-Men: Days of Future Past' to shame—are Instagrammable." • "A kaleidoscope of weirdness and innovative visual effects successfully introduce the newest Marvel superhero," USA Today's Brian Truitt writes. Cumberbatch's "enchanting spirit" and "clever wit" are a highlight, on par with Downey's Iron Man. Ejiofor gives Mordo "an earnest quality, but also some gravitas for future adventures," while Swinton "adds sass, emotional depth and a little frailty to the wise-warrior archetype" to her character, the Ancient One. • "Say what you will about Doctor Strange, but it's nice to see a superhero movie where the skyscrapers do more than blow up for a change," The Los Angeles Times' Justin Chang writes. The stand-alone movie "is playful and distinctive enough to throw a wrench into the grinding gears of the Marvel assembly line," he adds, noting that it "both wholly embraces and gently mocks the unapologetic geekiness of the enterprise." Best of all, he writes, it doesn't feel like a typical superhero story. "For all its frenzied time-turning and dimension-hopping, the movie tells a fairly straightforward yet rewarding story of one man's emotional and philosophical growth as Strange comes to realize, in the words of another character: 'It's not all about you.'" • "You'd normally expect to find the likes of Benedict Cumberbatch, Tilda Swinton and Chiwetel Ejiofor topping the cast of some thematically venturesome, aesthetically respectable British drama set discreetly in the recent past. But here these terrific actors are playing comic book characters in a film the majority of whose audience members may never have seen any of them before," The Hollywood Reporter's Todd McCarthy writes. "Do comics-derived films really require thespians of this caliber when the effects and genre elements are their raisons d'etre? Well, no, but they unquestionably class up the joint by injecting wit, elocution, faces with character and commanding presence into material that needs all the elevation it can get to not seem entirely juvenile." • "There's nothing particularly new about serious, over-qualified actors being recruited to class up a Marvel movie. But the studio's latest, Doctor Strange, wouldn't work as well it as it does (and it mostly works very, very well) without Benedict Cumberbatch and Tilda Swinton—two actors, who in addition to being intelligent, top-shelf stars both project a slightly alien, otherworldly air," Entertainment Weekly's Chris Nashawaty writes. "They make what might seem ludicrously esoteric in the panels of a comic accessible and seductively engrossing." Tilda Swinton Plays "Shag, Marry, Kill"
• "Yes, this new project shares the same look, feel, and fancy corporate sheen as the rest of Marvel's rapidly expanding Avengers portfolio, but it also boasts an underlying originality and freshness missing from the increasingly cookie-cutter comic-book realm of late," Variety's Peter Debruge writes. "From this second-tier side character, the studio has created a thrilling existential dilemma in which its flawed hero's personal search for purpose dovetails beautifully with forays into the occult New Age realm of magic and sorcery where Doctor Strange ultimately finds his calling." • "For all the phantasmagoria and time-skipping, there is also much by the book, including the vaguely Christ-like, fallen and risen savior. The movie's more lysergic sections are followed with carefully aligned narrative bricks and mortar and sometimes sealed with a quip, as if to reassure you that there's nothing too far out about any of this," The New York Times' Manohla Dargis writes. "The space-and-time warping and mirrored realities in Doctor Strange are a blast," she adds. "They're inventive enough that they awaken wonder, provoking that delicious question: How did they do that?" Thankfully, Dargis notes, Derrickson "resists the temptation to loiter." • "Dr. Stephen Strange is not the most famous or distinctive of the Marvel characters, but thanks to Benedict Cumberbatch he might be the most entertaining," Vulture's David Edelstein writes. "It wasn't so long ago that Cumberbatch's lizard-like physiognomy seemed strange, indeed. But we've grown accustomed to his face, which makes those of other leading men look blandly proportional. In Doctor Strange, his slanted, wide-apart eyes fit the film's geometry. He's like a Picasso figure striding through a cubist universe—a place where walls can split into hard shards and open out like the Red Sea. Cumberbatch's Strange parts the material world like a Picasso Moses." • "The performances are consistently engaging: Cumberbatch remains charming and quippy whether he's full of himself or learning to let go and to face his fear, Swinton puts her otherworldly qualities to great use, and Rachel McAdams (as Strange's former and maybe future girlfriend) provides a much-needed degree of groundedness to the bizarre goings-on," The Wrap's Alonso Duralde writes. While Mikkelsen is "sadly underutilized," the fights scenes are a must-see. "When magicians battle, it's not just a matter of fists connecting and buildings collapsing...The effects shots here aren't just visually impressive," he says. "They actually let the narrative go to places it couldn't without this level of, you'll pardon the expression, wizardry."